Australia is an outstanding country for its varied destinations across its relatively small continent. Combining urban lifestyle in one place and nature’s wonders are truly worth your holiday especially during the summer. This ancient land holds thousands of awe-inspiring destinations to fulfill your summer holiday in Australia in many different geographic landscapes across the continent. Each city offers unique experiences, fashion districts, cultural cities, breathtaking beaches. You can have it all in Australia. But, first, plan your accommodations to get the best deals! Snorkeling in the Great Barrier Reef is a must do while you spend your summer holiday in Australia. This world’s greatest nature of marine life encompasses around 3000 reefs, 900 islands as well as small sandy isles. The hidden treasure of this underwater life ranging from various fish, clams, turtles, birds, and much more diversities. Snorkeling and scuba diving in Great Barrier Reef can be done in solos, groups, families, regardless if you are a beginner or an experienced diver. You may choose the tours that provide guidance or even marine biologist for educational purpose. Bondi Beach is the most iconic beach in Sydney located only 7 kilometers away from the city center. Popular among the locals and tourists, Bondi Beach has a lot to offer as the Sydney’s widest beach. The northern part offers the best swimming spot, while the southern part has the best magnet for surfers. The beach is lined with cafes, picnic areas, barbecues, and shops. 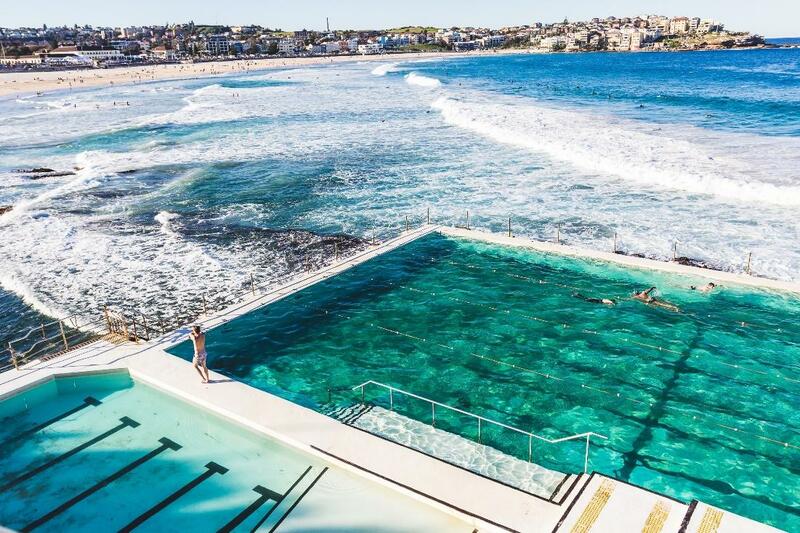 Bondi Beach also has its own skate park, and the infinity pool overlooking the vast ocean. Another prominent feature is The Bondi Pavilion, a community center for the art gallery, theater, and cultural activities. To ensure the safety of the tourists, there are lifeguards who patrol the beach. While spending the summer holiday in Australia, try not to miss sailing Whitsundays Islands, a sailing cruise that lasts usually three days and two nights in Queensland. Whitsundays Islands are tropical islands with pristine coastline and turquoise water. There are two gateways to Whitsundays: Proserpine and Hamilton Island and the majority of the budget cruise depart from Airlie Beach. From there you can bareboat or take public tours suitable for you. There are tours from backpacker parties to family-friendly ones. There’s nothing like chilling on a catamaran anchored in a remote island of Whitsundays with only a few people to enjoy the magnificent view especially the Whitehaven Beach. Furthermore, if you’re an experienced sailor, you may also go bareboating, where you can rent a sailing yacht without a license and be your own captain. Nothing beats camping on summer holidays in Australia, more special if you camp on the most famous Taronga Zoo, where you wake up to the view of Sydney Opera House and Harbour Bridge. Roar and Snore is an exclusive camp safari in the heart of Australia’s most famous zoo. It is a fully hosted camping facility where you will be experiencing intimate animal encounters, delightful foods, and of course safari style accommodation. There are also other camping options for more budget holiday such as Zoofari Lodge, Savannah Cabins, and Billabong Camp. Situated in Queensland, Gold Coast Theme Park has plentiful choices to attract visitors of all ages. It offers all sort of thrilling rides and slides, Australia native wildlife, swimming pools, swimming with dolphins and sharks or even meet your favorite superheroes. There is Dreamworld (the largest theme park) and features rides, shows, and attractions, including the tallest and fastest thrill rides in the world. White Water World where you can hire private cabana, surf lessons, and of course water slides! While Wet N’ Wild is the largest water theme park. It features a bunch of water attractions such as Kamikaze, the Black Hole, and many more. There are ranges of theme park passes from 3, 7, and 14 days available. Outing in the lush green fields while wine tasting at cellar doors is a not-to-be-missed experience while spending a summer holiday in Australia. Hunter Valley takes about 3 hours car ride from Sydney and is the ultimate spot to enjoy Semillon and Shiraz with an awe-inspiring view of vineyards. Hunter Valley is the perfect place to taste rich wine heritage that historically goes back to 180 years ago and a bunch of other varieties in 150 wineries surrounding the hills. You can opt to journey in a group or private. Now go ahead and click to get your best next flight to Australia!